Come sail away on a 3 hour open bar boat cruise around Manhattan. Enjoy dinner, dancing, raffles, and drinks. A night of fun with young professionals! *Early Bird Specials end 5/9! If you are unable to attend our event, and still want to make a donation CLICK HERE. Please check this box to receive or continue receiving periodic email updates from Inner-City Scholarship Fund. "Corporate Sponsorship (10 Tickets)" tickets cost $1,500.00, of which $950.00 is tax deductible. Pay next year's annual membership fee ahead of time and receive even better than an Early-Bird deal. 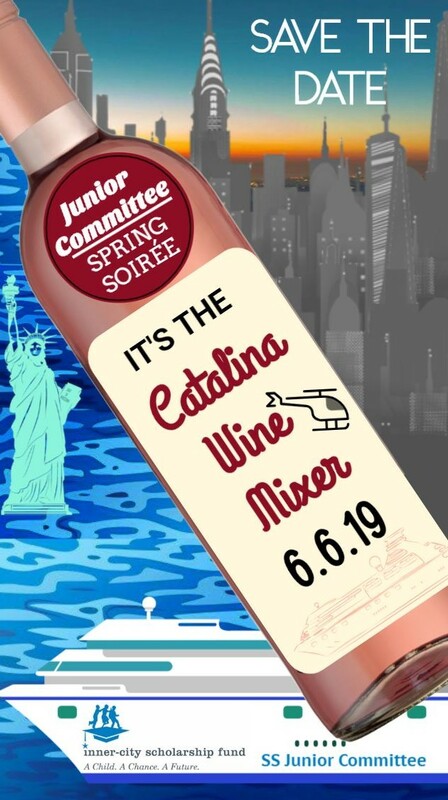 "1 Passenger + Junior Committee Membership 2019-2020" tickets cost $170.00, of which $115.00 is tax deductible. "Early Bird- Captain & Crew (4 Tickets)" tickets cost $320.00, of which $100.00 is tax deductible. "Early Bird- Passenger (1 Ticket)" tickets cost $85.00, of which $30.00 is tax deductible.